Catherynne M. Valente’s first Fairyland book, The Girl Who Circumnavigated Fairyland in a Ship of Her Own Making, established this series from the very start as a superbly written and sublimely beautiful story for children, and The Girl Who Raced Fairyland All the Way Home is a totally fitting conclusion to the story of September and her friends. It would perhaps be too much to ask for every installment of the series to be as good as the first one, and the fourth one (The Boy Who Lost Fairyland) stood out as decidedly different from the rest. Still, it did help to set up this finale, which is every bit as good—and even a little more polished—as the rest of the series. 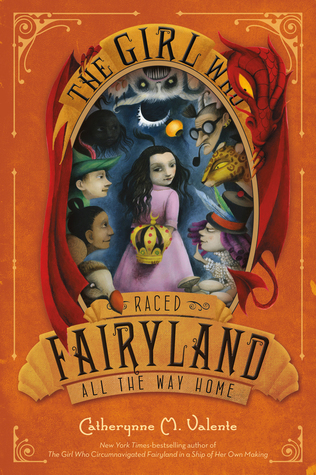 As with all of Valente’s previous Fairyland books, The Girl Who Raced Fairyland All the Way Home is both remarkably beautiful and remarkably fun to read. Having started off reading these books to my daughter as bedtime stories before she got too grown up to let me do it (and I’m convinced the only reason I got to keep reading to her until past her eleventh birthday was this series), I always suggest that those who can read the book aloud to the nearest child in their life, and that’s as true of the last volume of the series as it was of the first. Valente’s way with words only gets more refined with every novel she produces, and her gift for gorgeous near nonsense is on full display here. The best thing about The Girl Who Raced Fairyland All the Way Home, though, is that it’s a legitimately surprising ending to a series of this type. These kinds of journey through a magical world portal fantasies are generally stories about growing up, in which a young person must travel away from home in order to find their way back to a status quo, with the narrative being one in which, ultimately, the young person learns from their experience only to find contentment in eventual conformity to societal or familial expectations. These kinds of stories aren’t, on the surface, about hammering down the nail that sticks out, but the truth is that they usually end with submission rather than liberation. I probably shouldn’t have been surprised that Valente’s series ends differently than the norm, but it was a very nice surprise nonetheless. September becoming the new Green Wind and bringing her family to Fairyland permanently may feel a little too pat an ending for adults used to more cynical fare, but I would disagree wholeheartedly with that sentiment. Importantly, this ending isn’t accomplished too easily; there are twists and turns to this race, and there is a real sense of danger. Throughout it all is the significant concern that September’s time in Fairyland is running out for real this time and that her fledgling romance with Saturday is doomed. At the same time, September’s aunt and parents are themselves on a journey of discovery as they come to find their wayward daughter. By the end of it all, I was just happy that they all found each other at last, and the solution to all their problems isn’t simple or without cost at all. It’s an ending that feels earned and real, and if there is some surfeit of happiness in this, isn’t that the sort of story we should be telling children, after all? The Fairyland series isn’t just a delightful set of books for children; I would argue that it’s a deeply important and entirely necessary one. It doesn’t ask the reader to choose between the world we have and the world we want—it gives us hope that those worlds can be the same.